Nutra-Nuggets Performance Formula contains the perfect amount of nutrients for the health and performance of athletic or active dogs. 18 percent fat content helps to increase stamina while 28 percent protein helps to promote the repair and maintenance of strong muscles. Balanced levels of omega fatty acids round out this advanced formula, for optimal health of your high-performance companion. Chicken meal, ground maize, brewers dried rice, chicken fat, maize gluten meal, dried plain beet pulp, egg derivatives, fish meal, linseed, chicken digest, glucosamine hydrochloride (0.03%) and chondroitin sulphate (0.01%). 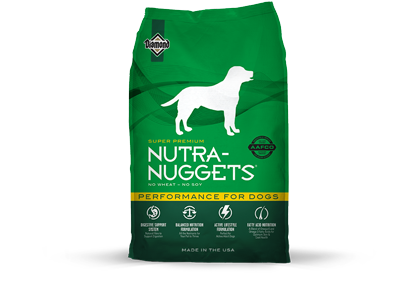 Nutra-Nuggets Performance Formula for Dogs is formulated to meet the nutritional levels established by the AAFCO Dog Food Nutrient Profiles for All Life Stages.